While farmers in the south are celebrating the good rains that fell over the weekend, the showers of blessing also caused massive devastation, including at least one death. A 22-year-old Namibia Wildlife Resorts (NWR) staff member drowned on Friday after the tent he was sleeping in was washed away at the Hobas campsite near the Fish River Canyon in the //Karas Region. 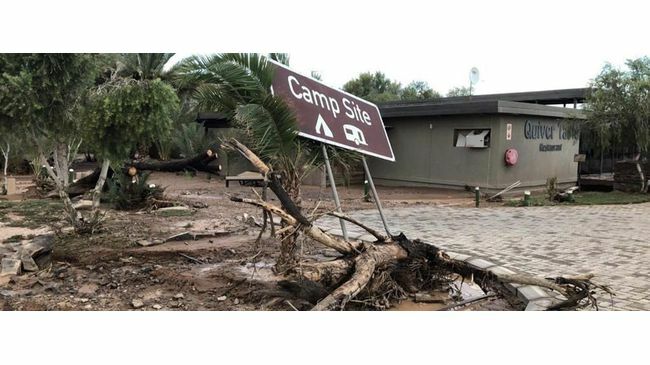 NWR spokesperson Mufaro Nesongano confirmed the incident, saying the camp experienced flash floods on Friday night, which resulted in the rivers along the lodge causing damage to their office area, restaurant and camping site. The deceased was identified as Ben Henry Markus. He was camping with a group of seven other visitors at Hobas Lodge. According to Nesongano, Markus was employed at NWR's Boplaas Campsite, but was camping at Hobas over the weekend. The campers' tents were erected in the river. The river apparently started rising rapidly at around 21:00 after heavy rains in the area, and strong currents swept away the campers. The other campers were rescued during Friday night, while Markus' body was discovered on Saturday. Hobas Lodge is located in the /Ai-/Ais Richtersveld Transfrontier Park near the Fish River Canyon. The lodge sits at the start of the 90 km long Fish River Canyon hiking trail. The south was delighted to finally receive some good rains over the past weekend, with several farms recording rainfall of more than 100 mm, while rain gauges at several places overflowed. Several farmers reported that dams were overflowing, while some said it was a welcome sight to have water in their dams for the first time in several months. At Kuubmansvlei in the Koës area 123 mm of rainfall was reported over the weekend, while Swatzput Farm in the Aroab area recorded 117 mm, according to farmer Johan Koen. Gerhard van der Westhuizen said his farm, also in the Aroab area, had a received massive 165 millimetres of rainfall. It was also reported that 80 mm was recorded at Aroab on Saturday and that Farm Koertzberg in the same area also received 80 mm on the same day. The farm dam at Farm Arbeid, located in the area of Klein Karas and Grünau, overflowed within eight hours of receiving good rains, while at the farmhouse 25 mm was measured. Maltahöhe reported 40 mm of rain within an hour on Friday and 60 mm was recorded at Aningnoas, located west of the Karasberge between Keetmanshoop and Grünau. Meanwhile, the Elnatan Private School athletics competition at Stampriet had to be cancelled this weekend because of the rainfall experienced at the town, while 20 mm was reported at Aranos over the weekend. On Friday, 20 mm was also recorded near Mariental. Keetmanshoop received 20 millimetres of rain between Friday and Saturday, while 30 mm was also measured at Otjiwa Lodge near Otjiwarongo. Gondwana's Canyon Lodge also received 40 mm of rain and the Roadhouse more than 60 mm. Both the Löwen and the Gaap rivers at Holoog were also flowing strongly over the weekend. The country has been experiencing prolonged dry-spells, with farmers' unions labelling the current drought situation in the country a national crisis.